A combination of eight cents airmail postage, thirteen cents for special delivery, twenty-five cents for registration with indemnity of $5.01 to $50.00 and four cents for a return receipt adds to fifty cents. This combination was possible from November 1, 1944 until August 1, 1946. 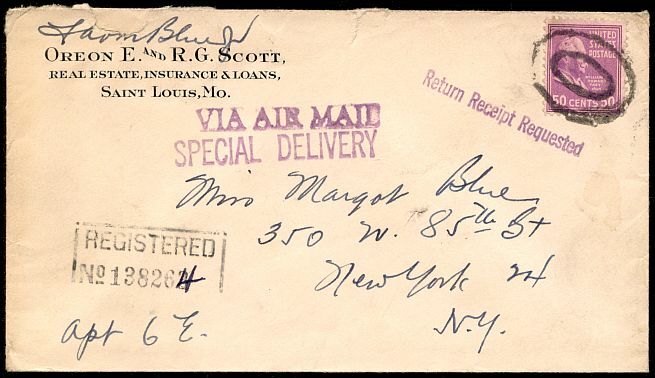 This letter was sent with the improbable combination of airmail, special delivery, and second step registration with return receipt requested in March of 1946. It was opened roughly, but how many of these can there be? Well, having said that, here's another, in better shape!